This is not just a visually striking shoe. Biion performs. and very little resistance in your swing. The dual density mid-sole is a remarkable shock absorb-er that gets you through 18 holes of golf, with amazing comfort. We've worked with orthopedic specialists and massage therapists focusing on fit, pressure points and support to design an inner foot-bed that compliments all of the above. Not only does this improve your golf game technically, it makes it more enjoyable. Isn't that the point? The massage nodes inside every Biion shoe give your feet a therapeutic feeling with every step. Reduce leg fatigue for greater performance down the stretch. The lightweight, flexible EVA material that each Biion is made of keeps you light on your feet, and comfortable before, during, and after your game. Maintain comfort throughout your game. Biion begins by keeping your foot cool with strategically placed ventilation throughout the shoe. Dual density, energy-return midsole. 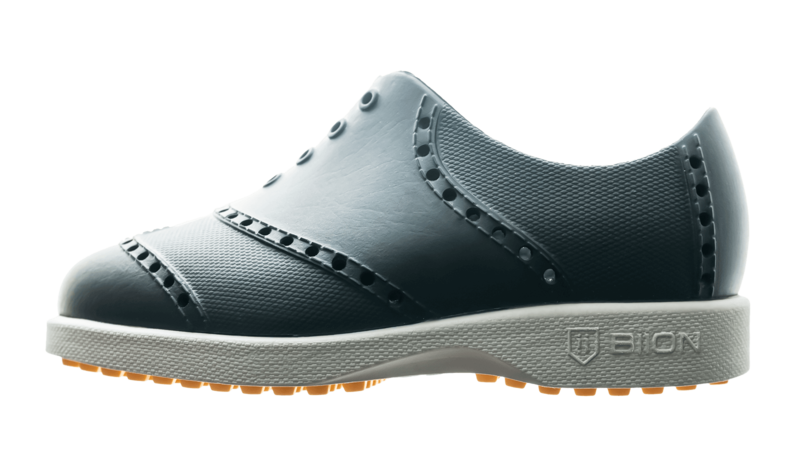 The Biion shoe works with the golfer, allowing for the natural movement of your feet through every step, and every swing. Biion’s spike-less HEXTRA-GRIP tread provides outstanding traction, strength and stability in your swing. What more do you need in a golf shoe? Low profile design places your foot much closer to the ground for stability, comfort and those quick corners. Washable, stain resistant colorfast, longer lasting design. 4 YEARS IN A ROW"
"I have played 25 rounds in a month and wore them everyday. My feet have never felt better. I love them."